Pershore is situated on the River Avon, approximately 10 miles from Worcester and 6 miles from Evesham. Pershore is on the main train line from London Paddington or via Worcester from Birmingham and the North. There are also good bus connections and Junction 7 of the M5 motorway is only 7 miles from Pershore. Pershore is an old Worcestershire Market Town famed for its elegant Georgian architecture and magnificent Abbey. It is surrounded by beautiful countryside and picturesque villages and is a haven for cyclists and ramblers and is only 10 miles from Broadway, the northern gateway to the Cotswolds. Pershore has many shops, an undercover market and welcoming pubs and restaurants. 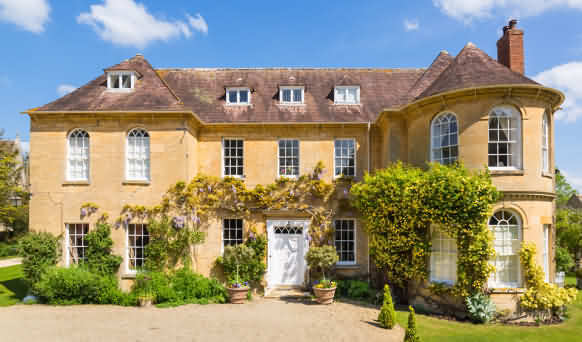 Set in 260 acres of farmland, Eckington Manor mixes charming old features with modern design. Rooms are located within 3 converted farm buildings, including a beamed 12th-century hall, but are decorated in a contemporary style. Free Wi-Fi access is available and there is free on-site parking. Located 4 miles from Pershore. Our Gold awarded accommodation features individually designed rooms and suites where our guests can truly relax and unwind. We strive for the best in everything we do, so that you can relax in the knowledge that every detail is taken care of. The rooms are all individually decorated, with silk wallpaper, antique and designer furniture, and Siberian goose-down pillows. All come with a flat-screen TV, and facilities for making tea and coffee. As well as award-winning accommodation, you can enjoy cookery lessons. Delicious, award-winning breakfasts are provided in the morning. The house is situated in an Area of Outstanding Natural Beauty, and there are plenty of footpaths for you to explore. You can see the prize-winning Aberdeen Angus and Highland cattle, sheep and Old Spot pigs roaming the land. 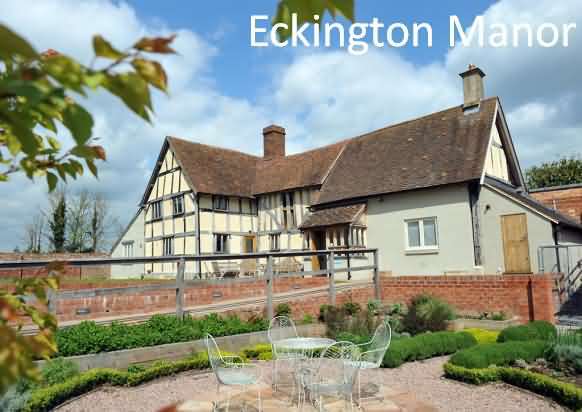 Eckington is just off the M5 motorway, and a 25-minute drive from Worcester. Cheltenham and Gloucester can be reached in around 30 minutes by car. This property also has one of the top-rated locations in Pershore! Guests are happier about it compared to other properties in the area. This property is also rated for the best value in Pershore! Guests are getting more for their money when compared to other properties in this city. 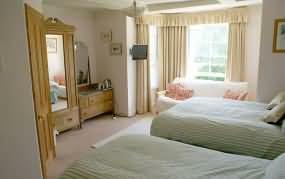 Arden Croft nestles on the lower slopes of Bredon Hill in the charming village of Great Comberton, near the River Avon. It is on the very edge of the Cotswolds being designated ‘an area of outstanding natural beauty’ - only 2.5 miles from Pershore and 7 miles from Evesham. The house itself was built in a farmhouse style using reclaimed Gloucester Dock bricks to blend in with the English village ambience. There are two en suite rooms, a double and a twin/double. There is adequate parking, a large lounge with smart TV and log burner, dining room, equipped with fridge, leading to a private guest patio. Full-English and continental breakfasts are served and special diets can be accommodated. WiFi is available. Whether you are visiting friends, taking in the historic sites, the Cheltenham Races, shopping, attending the Three Choirs Festival, walking the beautiful landscape of the Cotswold or just wanting a restful countryside break, Arden Croft offers you warm hospitality and a convenient place to stay. Arden Croft B&B is kept by Fran and Keith Biggin - read more about your hosts. This Vale of Evesham double room, with a Queen sized bed, has an en suite bathroom featuring an electric shower and heated towel rail, the shower being over the bath. The view is to the front of the property looking over our front garden towards an Elizabethan timber framed house with Bredon Hill in the background. 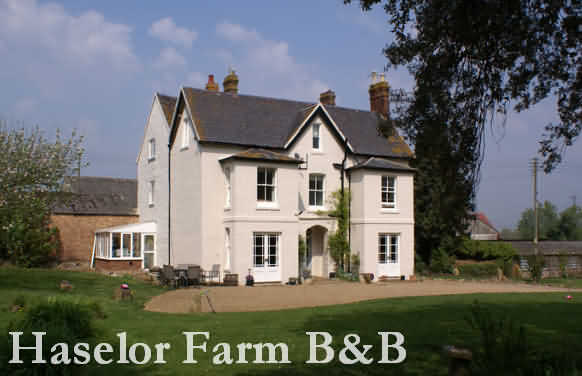 Tariff - £85.00 per room per night bed and breakfast, Single occupancy £55 per night. The name is taken from Bredon Hill which can be viewed from the window, along with our neighbour’s Elizabethan House. 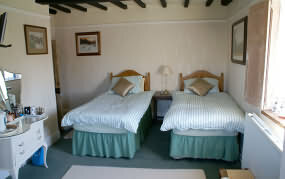 This room can either be used as a twin or a double (please state on booking) and is the larger of the two rooms. It has an en suite shower room with electric shower and heated towel rail. Use of a bath is available down the hall if desired. 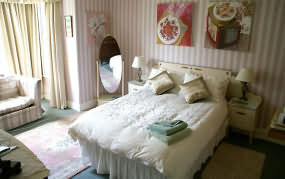 Tariff:- Double or twin room £90.00 per room per night bed and breakfast Single Occupancy £60 per night. Five stylish, cosy holiday cottages are set in 15 acres of mature gardens and grounds. Oozing character and charm they are the perfect place to entertain friends and clients, enjoy a family reunion or celebrate a hen party. 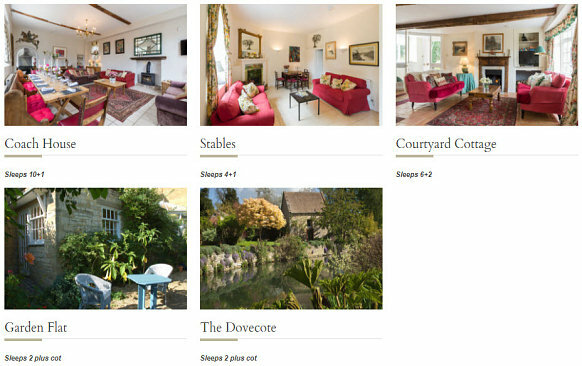 The ideal retreat for a long summer holiday, a family Cotswold Christmas or a romantic weekend hide-away. Located 7.7 miles form Pershore.